We guess you could call it a Black Friday sale, and it’s awesome. 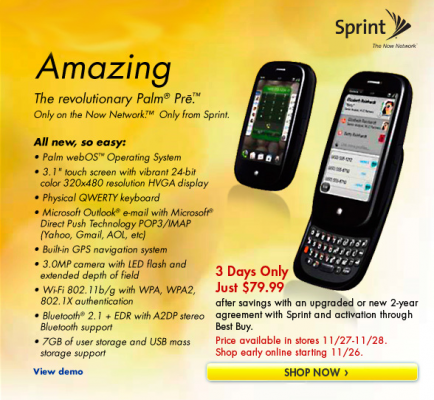 Shoppers at Best Buy on the Friday and Saturday after Thanksgiving will be able to grab a Sprint Palm Pre for the low low price of $79.99. This matches the lowest price we’ve seen for the Pre anywhere in the United States. However, unlike every other deal we’ve seen, this applies to both new Sprint customers and contract renewal upgrades! Online shoppers will also be able to take advantage of this sale a day early on Thanksgiving. Not that you shouldn’t be spending the day gorging on turkey with friends and family. If the above pricing story isn't wild and crazy enough for you, here's a rumor on the subject of Best Buy and Black Friday. Several tipsters have claimed that some stores may be having an unadvertised deal at opening. Take this with a grain of salt, but the first people through the door may be able to get a Palm Pre for the rock bottom price of free. We haven’t been able to confirm this yet, but we’ve heard it enough times that we thought it worth putting out there. Thanks to Alex (and Anonymous folks) for the tip!